All parents want to protect their kids, but this natural instinct can end up putting the child at even greater risk if the parent does not follow proper hygiene guidelines. A warning issued recently by the American Dental Association has pointed out the risks of parents attempting to clean a pacifier by putting it in their own mouth before giving it to their infant child. Although parents’ intentions are good, this practice is in fact exposing babies to bacteria that cause dental decay. The announcement by the American Dental Association came shortly after a study was published in the journal Pediatrics, in which researchers studied the bacteria that were transmitted to the pacifier by well-meaning parents. The research found that bacteria that are responsible for causing decay and cavities can be transferred from parent to child through the parent putting the pacifier in their mouth. Even very young children and babies who do not yet have teeth are put in danger by exposure to oral bacteria. These bacteria are very good at living in a human mouth, so they can hang around for a long time, feasting on natural sugars in the food that the child eats, and then attack the child’s teeth as soon as they begin to erupt. Also, parents should not make the mistake of thinking that decay that affects baby teeth is not important. Even though baby teeth will eventually be replaced by permanent ones, early dental decay can lead on to long-lasting complications such as gum disease. Cavities can also cause the child a lot of pain if they spread to the sensitive inner parts of the tooth. 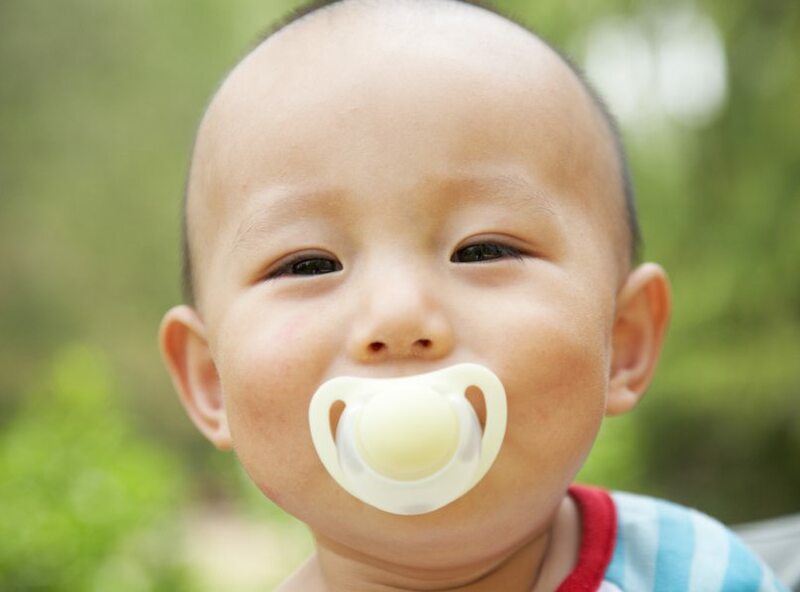 A better way to deal with the problem of dropped and dirtied pacifiers is to always keep a spare on hand. The child can be kept happy with the replacement pacifier, while the parent cleans the one that was dropped on the floor with an antibacterial wipe or sterilizing solution.